Various sizes and colors in our vast PVC sleeving- tubing collection. Sheath coax, wires, cables and hoses indoors or out. Stock up at our lowest prices ever. What is Halar® braided sleeving? Expandable braided sleeving is very similar to those "Chinese Finger Cuffs" that we've all gotten our fingers stuck in. When you push the end back, the sleeving expands to go over wires easily, and then when you let go, the sleeving comes back to its original diameter (or the diameter of your wire harness or bundle, whichever is larger). Ethylene-Chlorotrifluoroethylene (E-CTFE) is sold under the tradename Halar®. It is a highly chemical resistant material with excellent thermal stability, high moisture resistance, and very low outgassing. Because of its low smoke generation during a fire, it has been found suitable for plenum applications. Halar® has also been approved by NASA for use in the space program due to its low outgassing. Halar® Braided Sleeving is used in aerospace, military, fiber optic, and construction applications because of its high fire retardancy, low smoke generation, and low outgassing properties. Halar is a very cost effective alternative to PTFE because of these properties, and its high temperature resistance. Expando braided sleeving. 1/8" (3mm) to 7/16" (11mm). Olive green. -60ºC to +240ºC. Expansion ratio = 1:2. 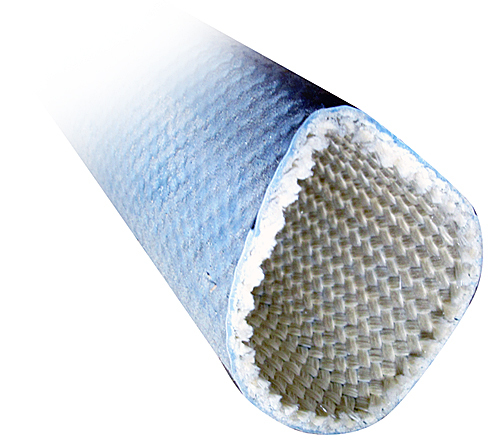 Expando HTNS-L/HO is a thin-wall braided sleeve manufactured from the meta-aramid Nomex. It is flexible, expandable and is self-extinguishing. The product is designed for the protection of wire and cable bundles against flame, high temperatures and mechanical abrasion. Expando HTNS-L/HO has an oil and water repellent treatment to reduce humidity absorption and to improve its resistance to fluids.This product is ideal for military, marine, aerospace and mass transit applications. Expansion ratio 1:2. UL 224 VW-1. F.A.R Pt 25. UL 94 VO (Raw material). Sold by the foot. Halar® "Flex-O" HT 1/8" braided sleeving. Expandable. 3/32" to 1/4". Black with white tracer. High temperature. Plenum rated Halar. 150ºC. UL2024. RoHS. Sold by the foot. Bentley Harris high temperature silicone rubber fiberglass tubing. 600v, 200ºC. 0.5" inner diameter. Alt. P/N: DMS 21090-0500. Mfg. P/N: 1/2-1151FR-B. Sold by the foot. (Factory pre-cut 50 foot lengths). Varflex Corp. syntholvar extruded tubing insulation sleeving. 0.042" inner diameter. Accepts 18 AWG. Sold by the foot or 500 foot reels. NSN: 5970-00-007-9604. Raychem HCTE orange convolex tubing. 0.281" size. Flexible. 0.275" inner diameter, 0.404" outer diameter. Sold by the foot. Raychem HCTE black convolex tubing. 196 foot rolls. High crush resistance. 0.427" inner diameter, 0.571" outer diameter. Mfg. P/N: 5470234017. Sold by the foot. 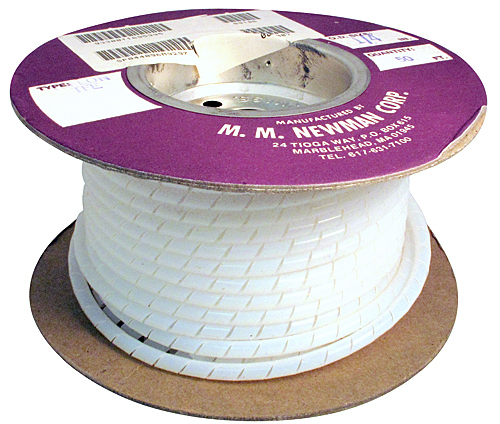 Markel Corp. white PVC insulation sleeving. Semi-rigid. 600v, 105ºC. 0.206" O.D., 0.156" I.D., 0.025" wall thickness. Available in 1,000 foot spools. NSN: 5970-00-248-9191. Hope Webbing Co. 1/4" cotton sleeves for authentic cable splicing and period correct electrical applications. "Anhydrous prepared." 3-1/4" long. Made in 1953 for Western Electric. In like-new condition. Surgical tubing. 1/4" O.D., 3/16" I.D. Sold by the foot. Surgical tubing. 1/4" O.D., 3/16" I.D. Pre-cut into 36" (3 ft) lengths. Great for sling shots. Hard to find high temperature aircraft sleeving. 1" I.D. (Inner Diameter), 600v, 200ºC. Made of silicone rubber. 50 foot lengths. 3/8" outside diameter, 3/16" inside diameter. Comes in 12' lengths. Use for air or vacuum. Tough stuff. 2400 p.s.i. tensile strength. Recreational uses include sling shot rubbers, resistance muscle exercise media and so many more applications that we cannot possibly list them all here. 11 gauge, 0.091" inner diameter, this natural color fiberglass sleeving is soft and flexible yet is tough enough to be specified for use in nuclear propulsion plant equipment... or aircraft or automobile. Buy it by the foot or a complete 250 foot spool. We have 600 available. 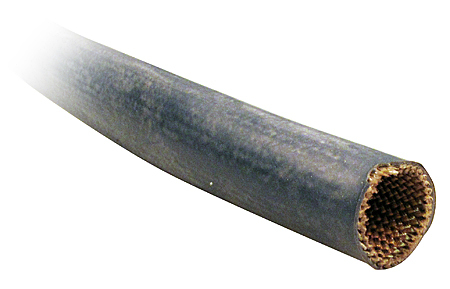 1-1/2" inner diameter Bentley Harris VW-1EX-FLEX heat treated fiberglass sleeving. Heavy duty but flexible weave protects cables from abrasion and heat. 2" inner diameter sleeving similar to above. Expandable polyester sleeving slips over any tubing, wires or cables to protect from abrasion and cutting. Impervious to heat (500ºF), chemicals, RF and electrical potentials. Use to jacket bare conductors or to move liquid / air. Markel high-temperature fiberglass insulation sleeving. Natural color. Inside diameter measures 0.875" - 0.911". 0.062" wall thickness. Sold by the foot. NSN: 5970-00-488-6244. 1-7/8". Shielded foil backed polyvinylchloride Loc-Trac zipper tubing wraps around existing cables, provides 100% shield, protection and tidies up area. Several sizes available. Poly-vinyl-chloride Loc-Trac zipper tubing wraps around existing cables, provides protection and tidys up area. Several sizes available. Spiral wrap Nylon tubing is an excellent wire harness that can be applied to bundle conductors terminated or not. Branches out between wraps. Several sizes available.